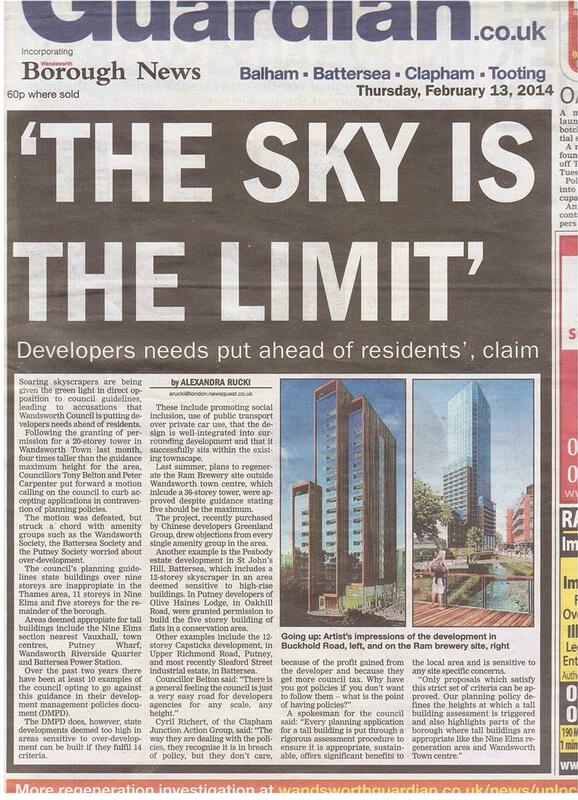 “Soaring skyscrapers are being given the green light in direct opposition of council policy, leading to accusations Wandsworth Council is putting developers needs ahead of residents“, says the Wandsworth Guardian in today’s edition. The ton of the article is indeed reflecting the general mood within the residents in the borough who have been facing major planning applications across the recent years. There are many more than 10 breaches, as it happened for almost all major and noticeable schemes recently. The policy DMS4 on Tall building counts 15 criteria, not 14. Olive Haines is 7storeys not 5 and it abuts a Conservation area and is not in one. More importantly 5 storeys is not the maximum height of tall buildings. 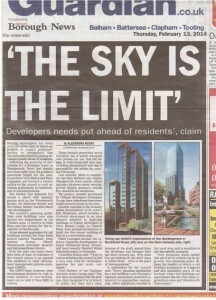 Over five storeys is the height(in most of Putney) at which the tall buildings policy comes into play. Buildings above 5 storeys are allowed by policy but then need to “integrate” into their surroundings. All the Upper Richmond Road was at least 8 storeys originally and they were never going to be reduced in height. The challenge for Putney was how an increase to 11, 12,13 or15 storeys could possibly integrate with a maximum of 4 storey existing buildings around them. And to be more precise, although it is right that increase density generates more Council tax, the main and immediate source of income that the Council is eager to grasp is the Community Infrastructure Levy, or former section 106, that is the money given by the developer following granted development permission. That’s what Ravi Govindia, Leader of Wandsworth Council, implied when he commented on the Ram Brewery site purchase by Chines developers: “It also delivers on the council’s top priority which is to redesign the Wandsworth Gyratory and remove through traffic from the high street”… thanks to the money given by the developers! Overall, a good article… and probably more to come.